Promote Blockity and Earn 30% Commission for Life! Are you currently a savvy affiliate marketer looking for an awesome seller with a high recurring earning potential? Or have you always wanted to try affiliate marketing but couldn’t find a product or service you could truly stand behind? Blockity has the solution for both cases. Promote our best-in-class DIY website builder and earn yourself 30% commissions for the life of the customers who sign on through your affiliate link! Think about that. When someone builds a business website, it’s seldom a short-term commitment. Our website builder is designed to grow with the needs of the businesses who use it and as long as they stay, you’ll get paid 30% of their bill every month. Killer Themes – all Blockity themes are responsive, render beautifully on all devices and screens, and look professional right from the start. New themes are released regularly! Truly DIY – we’ve all tried those supposed “easy to use” website builders, only to be disappointed with the Frankenstein-looking results. 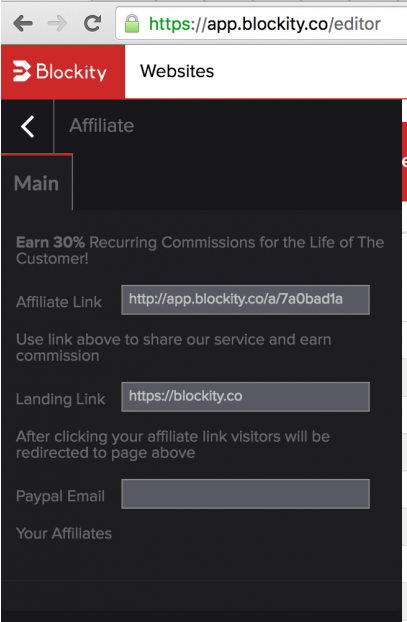 ANYONE can make a serious business website with Blockity. The drag-and-drop blocks, ease of positioning, and intuitive interface make it a cinch. Plus – updates are a breeze. Don’t underestimate the importance of this aspect – it’s something that is horribly neglected by our competitors. Awesome Support – Chat, email, and a comprehensive Q&A section make it simple for your affiliate customers to find help when they need it. Flexible Pricing – our FREE option is a great way to generate interest and get skeptical prospects to understand how powerful and game-changing the Blockity platform is. It doesn’t take long before serious prospects become paying customers. Your customers can start month-by-month as low as $9.90 and up to $39.90 monthly, or save money and pay for a yearly plan ($99, or $399 for the premium subscription). You’ll land lots of business with the low-price offering, and once customers see the potential it’s an easy upsell to the premium. 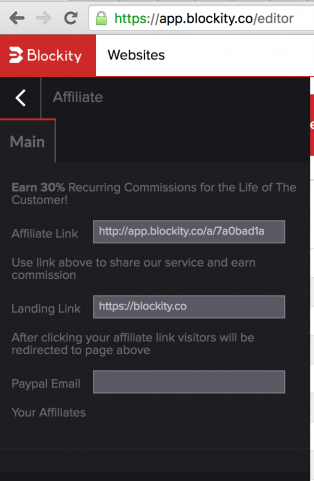 As the Blockity Affiliate Program grows we’ll develop more tools to make it easier for you to increase your income. Get started today selling the best DIY website builder on the market!